Ireland will play World Cup winners New Zealand and runners-up Australia as part of their autumn international series in Dublin in November 2016. Joe Schmidt's side will face an as yet unknown Tier 2 nation on Saturday 12 November, followed by a match against the All Blacks on 19 November. The Wallabies will visit the Aviva Stadium a week later, with the kick-off times still to be confirmed. 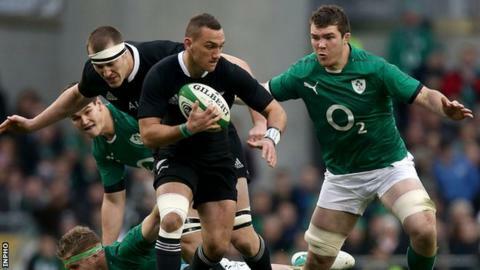 The Irish have never beaten New Zealand but came close in Dublin in 2013. On that occasion, a converted injury-time try gave the All Blacks a last-gasp 24-22 victory. "We again have a very attractive series to look forward to in 2016," said IRFU chief executive Philip Browne. "New Zealand return to Ireland for the first time since that incredible game in 2013 and Australia have shown that they are one of the most exciting and effective teams in world rugby after winning the Rugby Championship and finishing runner-up at the Rugby World Cup in 2015," he added. Meanwhile, Ireland Women will host England and Canada in November 2016 in their first ever home autumn international Series. Ireland, who played their first autumn international last month away to England, will host the return fixture in Dublin on the weekend of 12-13 November, before taking on Canada the following weekend.